Replacing real grass with commercial grade playground turf can take care of two very big issues at once: child safety and water savings. If you’ve ever seen or heard about a child falling from a jungle gym onto a hard surface like real grass, you know how vital a soft landing zone is in this arena. If you change out concrete or grass for turf and padding, not only will the parents be grateful, the kids will likely end up with fewer injuries, which will mean fewer issues for counties and cities. All of our commercial products come with a 10-year warranty. Another bonus is that playground turf doesn’t need water, so you can do your part to save water, too. If you think faux grass doesn’t look great, think again—and check out the new turf and turf padding that Watersavers offers; you won’t believe how far it has come! It’s thick and lush and looks so real you may have to touch it to make sure it’s not. Not only do our products really add to the safety of outdoor kid spaces, they make them beautiful. Every child should be able to safely run and play in a lovely, green space full of fun things to do. 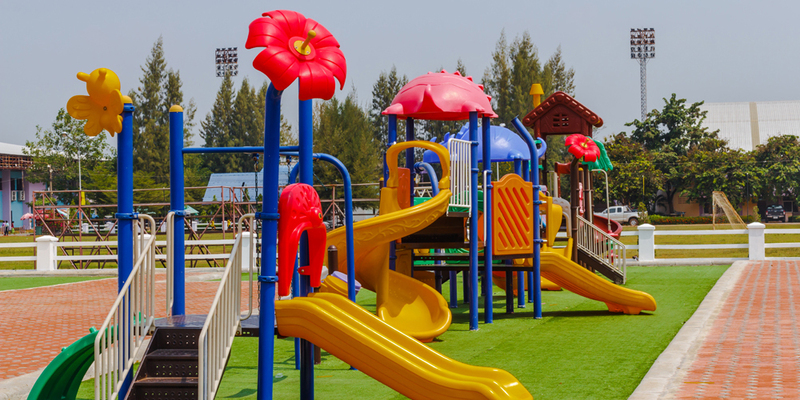 There are concerns that playground or sports field turf installations need to meet GMax Shock Attenuation Testing requirements. The most common way to meet these requirements is to use crumb rubber. This material is made of old, used tires, and contains lead. Since crumb rubber is a health issue, we do not promote or carry this material. So, we have a better solution! We offer a variety of lawn pads that have GMax ratings. When you use them in combination with infill and you can reach the desired level of shock absorption. Our lawn pads come in these thicknesses: ¾”, 1 1/8”, and 2 1/8”. Our synthetic turf products are tested by TSI, Dalton, Georgia. Public safety and playground safety go hand-in-hand. If you’re looking to make a play space safe, what could be better than having a child land on fake grass and high-grade playground padding? Playgrounds: they just don’t make them like they used to, which is really a good thing; plastic is taking the place of metal these days, and we are seeing more and more soft fall surfaces, too. Turf padding means kids will have a much softer fall than on real grass or concrete. According to the United States Consumer Product Safety Commission, more than 200,000 kids end up in the ER a year due to outdoor play area injuries. Nearly all of the injuries are due to falls from swings, climbers, and slides. Just think how many injuries could be avoided by putting in a softer surface like faux grass and turf padding! We can provide Certificates of Analysis upon request. Contact us for more information, or for GMax ratings on the padding. Before we get into the details about playground landscaping, let’s take a look at the history of these play areas. If you have a child—and even if you don’t—chances are you’ve spent some time on a playground. These are great places for kids to gain social skills while they play, and moms can also have a nice talk while they watch the kids. Can you believe these play spaces really didn’t exist until the mid-1850s? Though Germany claims it had the idea for the first outdoor play space (the early ones were just areas connected to schools), the first actual public one was built in Manchester, England, in 1859. The idea was to create a space where kids could learn to play nicely with each other, setting the stage for being adults. Almost 40 years after Manchester built its first play zone; the United States joined in and used this new area as a place for urban kids to play safely without the threat of traffic. In 1887, the first outdoor play space opened in San Francisco’s Golden Gate Park. In 1903, the feds started building play zones for poor children, and in 1906, the Playground Association of America was formed. The 1960s saw a huge number of outdoor play spaces being built. By the 1980s, there were plenty of lawsuits against the builders due to child injuries. That is when safety rules came into play, and thank goodness they did. Outdoor play spaces have also come a long way, and these days often feature playground landscaping that makes them look almost like a backyard! And not only does faux grass make a play area safe and look better, it does not need any water, so it is easy to keep up. It’s cost-friendly and eco-friendly, too. Playground Materials—Why Buy From Us? We offer many types of turf that are great for a public play space. We can give you free 1’ x 1’ samples so you can get a good sense of the quality, feel, and look of our product. All of the playground materials offered at Watersavers are lead-free and non-toxic, and we do not stock crumb rubber infill. Click here to get started or just pick up the phone and call us at 844-974-8873. If you’re looking for fake grass, turf padding, or faux lawn accessories, we have all you need to make a space pretty, safe, and fun. Public safety and water saving are two very issues these days, and our products help you achieve both at once. You can help us shape the playgrounds of tomorrow by being safety and water conscious today.